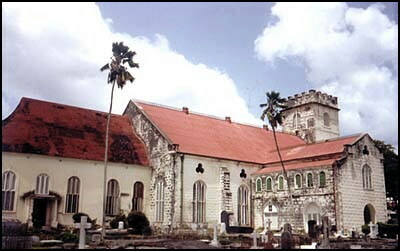 Will Barbados save St. Michael’s and All Angels Cathedral? …When it comes to reminders of British sovereignty and slavery, some folks in Barbados have the same goal. You watch the comments for this article. Every time Barbados Free Press talks about preserving some old building or plantation house, more than a few otherwise intelligent and well-meaning Bajans come online and say “Let it rot” – or as in the case of Sam Lord’s Castle, “Let it Burn”. These folks who want to remove every vestige of British history on this island are not just a few on the fringe. Although this feeling, attitude or undercurrent isn’t spoken about in the news media, it is real, widespread and it influences the actions of our so-called leaders too. And that’s a shame because the end result is we are losing our history and our heritage because whenever there is a choice to be made about preserving our history, we as a society willfully let it rot and fade away. Neglect is just as effective as a bulldozer, except that using a bulldozer is a more honest action. When I walk these fields and these hills and see the burned out remnants of plantation houses and the fallen walls, I touch the now-crumbled marl and think of the men and women who built the walls and the houses. Slaves, or freed slaves but still in slavery of a sort, ripped from their home countries and shipped like cattle to Barbados. Dying, starving, whipped and raped along the journey – only to arrive as possessions in a strange and brutal world. They built St. Michael’s Cathedral. They built the plantation houses and the windmills and the signal towers. These buildings are monuments to British Imperialism it’s true, but moreso they are monuments to our ancestors named and unnamed who sleep in unmarked mass graves. We need seven million dollars to restore and save St. Michael’s and All Angels Cathedral. Open your wallet or purse and say “save it”, or keep your money to yourself and say “Let it rot”. Above photo: Barbados: South Coast Boardwalk yesterday.